Last week I watched the “Reinvent Learning” roundtable with Howard Reingold. As I walked and ran on my treadmill (got in a good 14 k), I listened to the pronouncements of all the experts about what is happening or should happen in education right now. Lots of food for thought but two things really got me questioning this leadership and that despite their great ideas – they don’t quite “get it” and live in a little bit of a plastic bubble. 1. Communication. I was struck by their “lingo”. Now, I’m well versed in it but even I had a hard time following each person’s plethora of terms and labels. If you can’t communicate in a simple fashion, what should be done and why – it doesn’t stand a chance of ever getting done. We have to get rid of all this “educationalese” before any substantial reform will happen in the constituency that counts – students, parents, the common man. 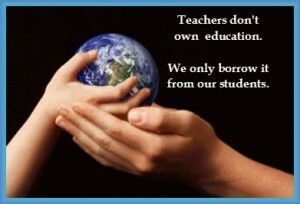 We as educators have to speak simply, commuicate the essential of what education really is and its importance. 2. Power. There seemed to be a pink elephant in the room that nobody wanted to talk about – namely “who has the right to tell anyone what they need and must learn?” The point was touched on ever briefly but I feel it is central to what is happening in the present learning revolution. Also, who has the right to tell a person, even a child, they must go to school? We need a real reformation in education, not just reform. Having read my Erasmus, the reformation was all about challenging the powers that be, decentralizing and making it about the people and not pronouncements and power. The reformation had a profound effect and a reformation in education could have the same. It could take the power to certify, to graduate, to say “who passes Go” out of the hands of the academic watch towers and into the hands of the community and the people actually teaching and learning. It would give value to learning and not just “doing time”. This to me IS the issue and focus of change these days. Everything revolves around it. Technologies allow access to knowledge/learning for pennies to all – how we handle this, just like the Reformation eliminating intermediaries between man and god, is what we’ll be judged by. Not whether we are for or against digital learning etc …. We need to begin making our schooling our education (to paraphrase and reference Twain’s famous quote). That process begins today with all of us tearing down the walls, the authority, the ivory towers that stand between the student and learning. Next story What is your metaphor?